Excavation; The Beginning. Saturday 14th July. Of course, there are many things that need to be done before an excavation can begin – historical research, fund raising, tool and people coordination amongst others. After this, however, the dig can begin! A team of local volunteers, staff from the National Botanic Garden of Wales (for information see http://www.gardenofwales.org.uk) and local archaeologists were on hand to start the dig which is directed by Professor David Austin. To dig a trench it is neccessary to remove the turf (de-turfing) so that we can get to the soil below. We stacked the turf up in a pile (visible in the image below behind the mound of soil) and then began removing the soil from the trench area. As trench 1 is in the same location as a trench in last year’s excavation, the soil that we were digging out was the back fill from last year. As such we could remove this soil without the danger of destroying any archaeology. Below this backfill is a sheet of teram fabric (visible in left part of trench in image below) to protect the underlying archaeology which makes digging down to the level reached last year particularly easy. The weather was kind to us on our first day too – no rain and a little sunshine; perfect digging conditions as the soil neither bakes solid nor becomes a quagmire. Due to this we managed to move a good amount of soil through a tag team of mattockers, shovelers and wheel barrow pushers. The picture above shows the progress at the end of an afternoon’s consolidated work! 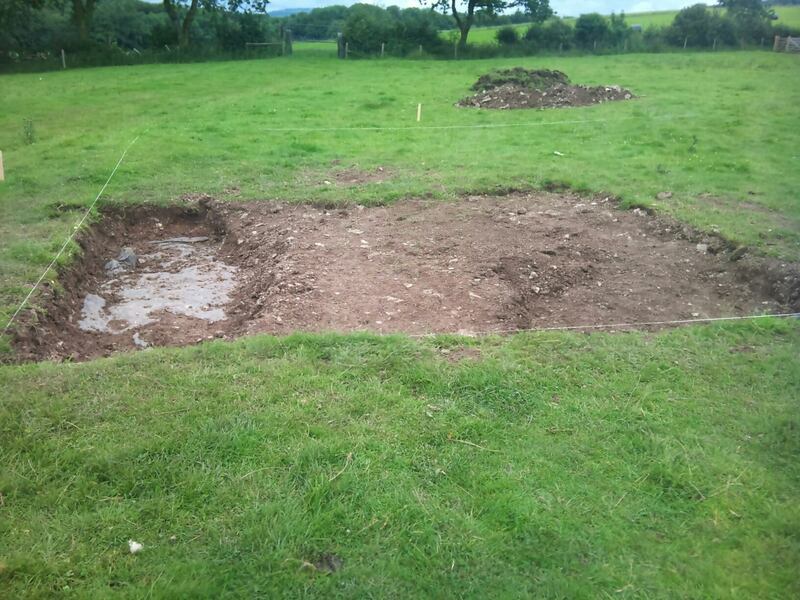 This entry was posted in Excavation and tagged archaeology, carmarthenshire, cymru, garden, middleton, national botanic garden, wales.